Representative Jeff Keicher, R-Sycamore, speaks Tuesday at a Capitol press conference to introduce HJR06 and HB 275. State Representative Steve Reick (R-Woodstock), along with State Representatives Jeff Keicher (R-Sycamore), Dan Swanson (R-Alpha), Amy Grant (R-Wheaton) and Daniel Ugaste (R-Geneva), are urging lawmakers to authorize a private sector “deep dive” into state agency spending so that opportunities for cost savings and greater efficiencies can be identified. Reick’s HJR06 and HB275 are modeled after President Ronald Reagan’s 1982 executive order calling for a private sector study on cost control, which resulted in the 1984 ‘Grace Commission’ report. That audit led to 2,487 separate recommendations for streamlining government agencies in ways that would have saved hundreds of billions. 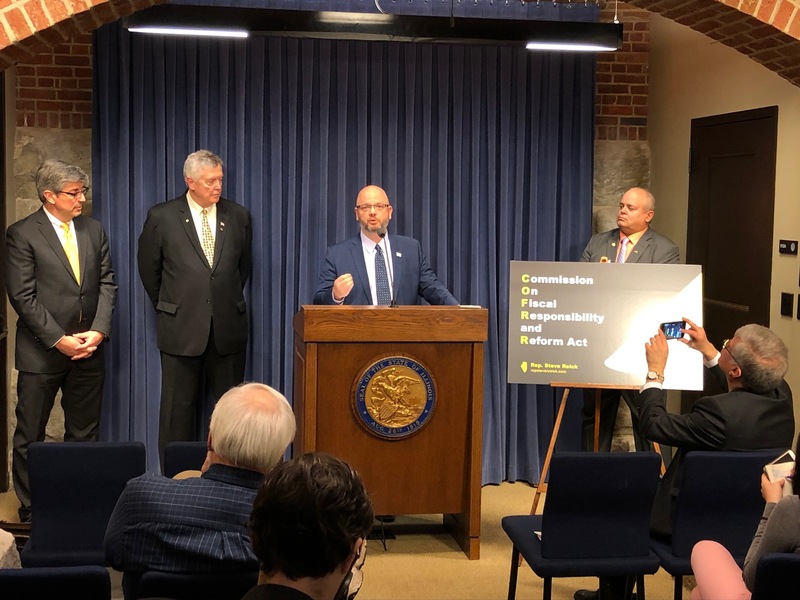 “By identifying inefficiencies, redundancies and insufficient control over the operations of state agencies which result in inadequate services being provided at too high a cost, we can make adjustments and provide taxpayers with the value they deserve,” Reick said. Specifically, HJR06 provides the legislative intent for the establishment of the Commission and points to the State’s obligation to provide public services necessary to ensure that Illinoisans can live in dignity and safety. HB275 creates the Commission on Fiscal Responsibility and Reform Act. The panel would consist of 18 voting members, including three members each appointed by the House Speaker, House Minority Leader, Senate President and Senate Minority Leader, and six members appointed by the Governor with not more than four members from the same political party. Like the Grace Commission, this Commission would be privately funded by soliciting contributions to be made to a 501(c)(4) social welfare organization as Commission members would not be paid, and results would be presented to the Governor and the General Assembly by October 1, 2020.